OSB ~ A Great Look for Less! OSB stands for oriented strand board. OSB has the appearance of giant cornflakes pressed together to form structural panels in sizes similar to plywood, such as 4′ x 8′ x 5/8″. OSB is basically a construction grade materials that is rarely seen in a finished product. It is the hidden sub floor below the “finished” flooring, whether that be hardwood flooring, carpet, vinyl, tile or anything else. However, in recent years, the industrial look has become more popular and OSB is making its way into finished decor. We first saw OSB used on the second floor of a heritage home. The owners told us that the original hardwoods were beyond repair and they saw OSB as a great alternative. I am often so disappointed when I visit old homes and see that the original hardwoods have been replaces with laminate or carpet. When I saw the exposed OSB flooring, I immediately loved the look and the concept. It is like a wood/cork look and because it is completely different from hardwood flooring, it didn’t compete with original floors that remained on the main floor of the house. Here is a shot of the OSB floors we saw in the heritage home. We went on to buy this house, but that is a story for another time. The floors were very inexpensive, durable and offered a great unique look. I loved them and knew they would work perfectly on the upper floor of our 1921 home as well. If you are looking for an inexpensive and easy alternative to update your flooring, look no further. I believe the second floor of our home has around 700 square feet. When we moved in, the upstairs was completely covered in 1970’s brown carpet (except for the bathroom). Despite the fact that we live in a heritage home, we were told that there was no hardwood flooring beneath the carpet. We also knew that laying new hardwoods would not only be very expensive, but also crazy with two small children occupying the entire upper floor. We wanted a great look, but without having to “police” the floors. We decided to replace the ugly carpet with oriented strand board similar to the floors we saw in the other house. We bought the OSB from Home Depot and laid the 4 X 8 sheets on the entire second floor. The boards are made with a “tongue and groove” edge, so the seams fit tightly together. Once all the boards were in, we rented a sander from Home Depot and proceeded to sand the wood down to get a nice blond finish. Tim put on several coats of urethane for durability and when all was said and done, we completed the entire second floor for under $700 (including wood, machine rental, urethane and the roller for application). I absolutely love the textured look and we are not concerned about the wear and tear on the floors. Our son even plays floor hockey in the oversized landing area! We did the floors 5 years ago and they have proven to be durable and completely kid proof. 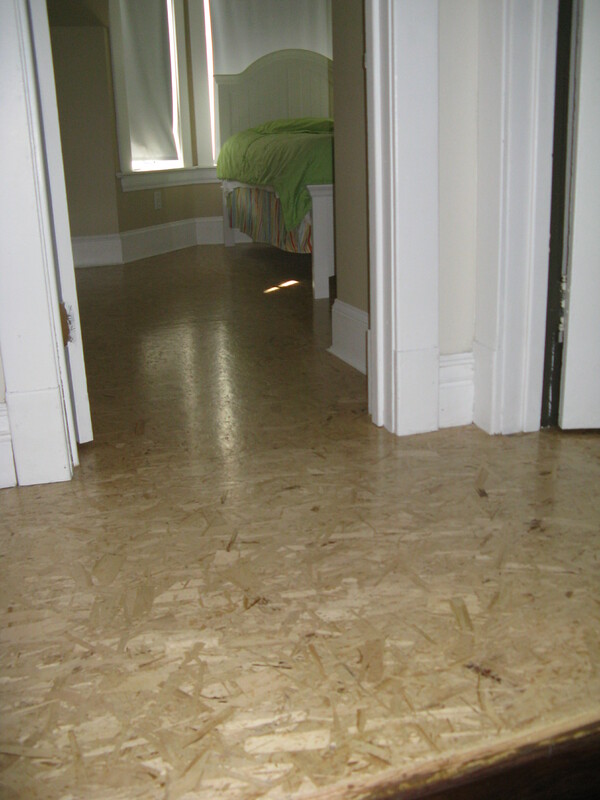 In fact, we will also consider OSB for our basement floors….if we ever get that far in the renovations! Here is a short slide show of the OSB floors on our second story. Posted on September 20, 2013 by Cindy Roy •	This entry was posted in DIY and Upcycling, Home Decor and tagged DIY flooring, floors for less, inexpensive flooring, new floors on a budget, oriented strand board, oriented strand board floors, OSB floors, remodelling for less, remodelling on a budget, upcycled USB. Bookmark the permalink.